Editors: Sansone, Carol, Morf, Carolyn C. and Panter, A.T. The genius of social psychology as a field has been its ability to investigate the seemingly complicated behaviors that characterize humans as social creatures. 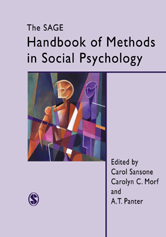 The SAGE Handbook of Methods in Social Psychology simplifies this complexity by providing researchers and students with an overview of the rich history of methodological innovation in both basic and applied research within social psychology.